Made daily with fresh avocados. Chef's Favorite! Made with roasted pumpkin seeds. Chips smothered with beans, cheese and ranchero sauce. Same as above, but add sour cream, guacamole and your choice of protein. 3 corn tortillas filled with shredded chicken or beef and garnished with sour cream and guacamole. Large crispy flour tortilla filled with shredded chicken and garnished with sour cream and guacamole. Fish marinated in lime juice, tomatoes, red onions jalapenos and cilantro. Served on a crispy corn tortilla with guacamole. Cooked and chilled shrimp in a spicy Mexican inspired cocktail sauce. Chicken wings marinated in a complex and spicy blend of Caribbean spices. Fried puffed corn and black bean masa topped with cabbage, marinated onions, cheese, pico de gallo black beans and guacamole. Corn masa stuffed with cheese, then grilled and topped with cabbage, beans, cheese, pico de gallo, guacamole and your choice of protein. A warm and comforting Mecixan Meatball soup. A delicious combination of chicken and lime and vegetables. This delicious seafood stew includes: scallops, mahi-mahi and shrimp simmered with okra, tomatoes, thyme and other spices and hot chiles. Its Spicy!! Cactus, black beans, corn, lettuce, guacamole, bell peppers, red onions, tomatoes and your choice of protein with our famous cilantro lime dressing. Crispy flour tortilla filled with lettuce, beans, pico de gallo, cheese, sour cream and guacamole. Add your favorite protein- Additional cost. Tender greens, carrots, red cabbage and tomato topped with a chicken breast grilled to perfection.Served with your choice of dressing. Tender greens, carrots, red cabbage, and tomato. Served with your choice of dressing. Your choice of pinto or black beans, cheese and green or red sauce. Tender chunks of beef simmered in our spicy Colorado sauce made with guajillo and New Mexican chiles. Two chile rellenos stuffed in a savory burrito. Tender chunks of pork simmered in our tomatillo sauce. First choose your protein: char-grilled asada, shredded chicken, shredded beef, grilled chicken or carnitas. Then choose your fillings: grilled vegetables, pinto beans, black beans, sour cream, guacamole, pico de gallo, red sauce, green sauce, ranchero sauce and cheese. Corn tortillas stuffed with cheese and topped with sauce and melted cheese. Add shredded chicken or beef-additional cost. Fresh grilled shrimp wrapped in a corn tortilla and smothered in our tomatillo sauce and cheese. Tender chunks of crab meat wrapped in corn tortillas and smothered in a creamy tequila lime sauce and cheese. Chunks of sweet lobster meat wrapped in corn tortillas and topped with a creamy tequila and lime sauce and cheese. California green chile stuffed with cheese and covered with Ranchero sauce and cheese. Chicken, beef or vegetable topped with sauce and cheese. 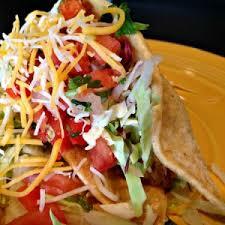 Crispy corn tortilla filled with shredded beef or chicken, topped with lettuce, pico de gallo and cheese. Corn tortilla filled with grilled halibut, cheese, pico de gallo, cabbage and chimichurri sauce. Corn tortilla filled with your choice of char-grilled asada, chicken or carnitas topped with cilantro, onion and green sauce. Corn tortilla filled with fresh salmon, cheese, pico de gallo, cabbage and chimichurri sauce. Corn tortilla filled with grilled shrimp, cabbage, tropical fruit salsa, papaya sauce and cheese. Baja-style: fried mahi-mahi, cabbage, yogurt chipotle sauce, pico de gallo and cheese. Tropical-style: grilled mahi-mahi, cabbage, tropical fruit salsa, papaya sauce and cheese. Corn tortilla filled with your choice of char-grilled asada, shredded chicken, shredded beef, chicken or carnitas topped with lettuce, pico de gallo and cheese. Corn tortilla filled with grilled tilapia, cheese, pico de gallo, cabbage and chimichurri sauce. Jumbo shrimp, lightly battered and breaded with coconut. Served with spicy dipping sauce. Two 7oz broiled lobster tails served with clarified butter. 8oz grilled salmon filet served with creamy or regular chimichurri sauce. Jumbo shrimp simmered in a hot and spicy habanero sauce. 4oz Filet Mignon grilled to order with a 7oz broiled lobster tail. Served with clarified butter. Topped with a chimichurri cream sauce (like Seafood Newburg with spice). 8oz filet of Chilean Sean bass, grilled and served with a garlic butter. Mild, fresh water white fish grilled and topped with a spicy Mexican tomato sauce. Jumbo shrimp marinated in Recado Rojo sauce (a blend of cumin, cinnamon, oregano, garlic and citrus juice) and grilled. Jumbo shrimp and scallops sautéed in garlic, butter, white wine and parsley. Bone in pork slowly braised till fork tender. Tender chunks of beef simmered in our spicy colorado sauce. Tender chunks of pork simmered in mild tomatillo sauce. Chicken, steak or shrimp seared with onions, bell peppers and tomatoes on a cast sizzling iron skillet. Combo meats and shrimp an additional charge. ALL ITEMS (EXCEPT FISH POT) SERVED WITH WARM FLOUR OR CORN TORTILLAS, BEANS AND RICE. Chicken marinated in a complex blend of spicy Caribbean herbs and spices, habanero chili and a touch of citrus, then grilled in the traditional method developed by the Maroons. Tender Filets of fresh Mahi-Mahi marinated in a exotic blend of fruit, and achiote (annatto seeds, herbs and bitter orange) then grilled to perfection. Choice ribeye steak marinated in Cuban adobo, flash grilled and topped with sizzling grilled onions and our mojo sauce. Tender Filet of Mahi-Mahi rubbed with Cajun spiced, grilled and topped with our mojo sauce. Choice cut of filet cooked to order and topped with our mojo sauce and served sizzling on a cast iron skillet. Delicious seafood stew made with scallops, Mahi, and shrimp, simmered with okra, tomatoes Thyme, chilies, orange zest and spices round out the sauce. Served with corn or flour tortillas and rice. Cochinita Pibil- SERVED FRIDAY, SATURDAY, AND SUNDAY ONLY. This traditional Yucatan dish is filled with pork marinated in achiote (annatto seeds, herbs and bitter orange) citrus, chilies and spices, then slow cooked in a banana leaf. Corn tortillas filled with shredded chicken or beef deep fried and garnished with sour cream and guacamole. Flour tortilla filled with cheese and grilled. Topped with sour cream and guacamole. Flour tortilla filled with your your choice of black or pinto beans, cheese and your choice of green or red sauce.